Two major display technologies are used today to create high-end premium TVs, OLEDs and QLEDs. This article aims to compare these two technologies and detail the market status of both the premium TV market. While OLED is a next-generation display technology that uses organic materials that emit light when electricity is applied, QLED TVs are still LED-backlit LCD TVs, but ones enhanced with quantum-dots materials. QLED TVs also called QDLED (or QD-LED) TVs and QD TVs. Reviews of OLED TVs are terrific, and most experts and consumers agree that these OLED TVs are the best TVs ever produced - with virtually perfect image quality and beautiful form factors. An OLED (Organic Light Emitting Diodes) panel is made from organic (carbon-based) materials that emit light when electricity is applied. An OLED TV is made from millions of pixels, each made from red, green and blue tiny OLED materials. Or at least that's the theory, all current OLED TV panels are made by LG which is using a slightly different architecture - white OLED pixels with color filters on top. A QLED TV is a confusing term - as it should actually be called LED-backlit LCD enhanced with Quantum Dots (QD) materials. This is still LCD technology, which uses LEDs as the backlight source (instead of the fluorescent tubes used in older LCDs) and liquid crystals and color filters to control and modulate the light. In regular LCDs the backlight is white - but in QLEDs the backlight emits blue light which is converted to white by the quantum dots coating. As OLEDs are self-emissive, the contrast ratio is much better in an OLED (true blacks). OLEDs also feature much faster refresh rates and wider viewing angels. Next-gen designs: OLEDs are thinner and lighter than LCD panels. OLEDs can be made flexible, and companies are developing bendable, rollable and transparent OLED TVs. A major disadvantage of OLED panels is burn-in and image retention. As each pixel degrades differently according to its use, this could be a real issue. What about emissive quantum dots TVs? Current QLED TVs use the photo-luminescence qualities of quantum dots - the fact that they can absorb light at a certain wavelength and emit a light at a different wavelength (specifically convert blue light to white). In a similar fashion to OLED materials, QDs also feature electro-luminescence, which means that light is emitted when electricity is applied. This means that in the future QDs could be used to create true emissive displays, one that do not require color filters and liquid crystal to module the light. These kinds of displays are already in development and the hope is that true QD-LED TVs will feature the image quality of OLED displays but at an even higher efficiency. As of 2019, the only company that produces produces OLED TV panels is LG Display - making 55" to 88" OLEDs that offer the best image quality possible today. 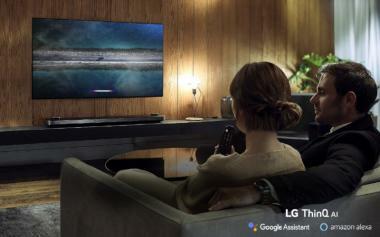 LGD is offering its OLED panels to many companies, including LG Electronics, Sony, Panasonic and many other companies. LG's 2019 TVs include the top of the range Z9 OLED TV which uses LGD's latest large 8K 88" OLED panel, the Wallpaper OLED W9and midrange OLED E9 and OLED C9 - and also the world's first rollable OLED device - a TV that rolls into its base - the 65" Signature OLED TV R! These TVs are not shipping yet, but LG will probably release them by March 2019. In the meantime you can still buy the LG's 2018 OLED TV lineup which includes the flagship Wallpaper OLEDW8 the high-end OLED-on-glass OLEDG8 and OLEDE8, the basic OLEDC8 and the entry level OLEDB8. 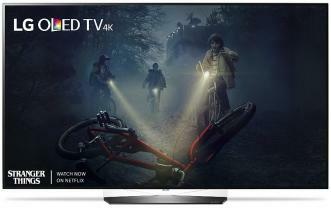 The most popular model seems to be the OLEDC8 which costs $8,999 for the 77" model, $3,199 for the 65" model and $2,299 for the 55" model (note: affiliate links to Amazon.com). LG is also providing its OLED TV panels to many other companies - including Sony which currently offers the high-end AF9 and AF8 (Sony's 2019 TVs will include the Master-Series A9G and the A8G). Sony started shipping the AF8 TVs in April 2018 and - the 55" model currently costs $2,300 while the 65" one costs $3,000 (note: affiliate links to Amazon). Other companies that produce OLED TVs include Panasonic, Grundig, Philips, Metz, Loewe, Skyworth, Changhong, Haier, Konka and more. Samsung Display is developing hybrid QD-OLED TV technology, and according to estimates, the company aims to begin trial production in 2019. Samsung's TVs will be based on blue OLED emitters with a color-conversion layer built from ink-jet printed quantum dots. It will be interesting to see how Samsung manages to overcome the many challenges in this design and whether it will offer any real advantages over LG's current WRGB architecture. For more information on QD-OLEDs, see here.